Autumn's environment was toxic, causing her mind to be overwhelmed with negative thoughts. She looked deep inside herself and found the courage to fight for a new life! I wasn't living life the way a 22-year-old woman should. I went to work without eating breakfast or quickly ate a bowl of cereal and headed out the door. I worked at Starbucks, which was connected to Panera Bread. I ate most of my lunches and dinners there because of the convenience of things like tomato basil soup in a bread bowl with a side of bread. I loved the free Starbucks drinks during my shifts too much as well. I gained weight and felt more terrible about myself and my body every day. I had no self-control and it showed in the mirror. I didn't think about eating late at night and didn't care what I put into my body. I didn't realize the difference between carbs and protein and paid no attention to sugar or fat. Toward the end of the year, I didn't want to look at myself anymore. I went from a size 4 to a size 8, had a terrible image of myself, and never had energy. I woke up feeling awful and went to bed feeling worse. After a few years, my life was falling apart because of unhealthy decisions. I couldn't live another day in the dumps. I knew I was better than that. I knew somewhere deep in my soul was the ability to change my life. Starting in January 2012, I did just that. I set a goal and was ready to give everything I had to achieve and surpass it. I set a goal to lose weight and compete in a figure competition. It was scary because I hated my body and was going to step onstage to be judged. It took 22 weeks to lose 38 pounds and 20 percent body fat. At first, my family was iffy about my sudden change in habits and personality. They weren't supportive of my goal to be a figure athlete, but I continued forward anyway. After they saw my transformation and the positive impact it had on my life, they are much more supportive now. They still don't understand it completely, but they are there for me. My boyfriend is also my trainer and has been there for me since day one. My new lifestyle made us closer. I love my body and I'm proud of the hard work I put in to create the lifestyle I live. I will never go back to the way I used to live with no self-control in a bubble of fear. I was afraid to fail at anything and never made goals for myself. I'm glad I took the leap of faith because my life is absolutely amazing now. I'm healthier than ever and consider myself an athlete. I went from lethargic to athletic in 22 weeks. If I can do it, so can you. Believe in yourself and make the change. The changes I made were slow because I didn't know about healthy foods and I wasn't a gym member. I joined Fitness Connection nearby, researched healthy foods online, and asked others for advice. I found Bodybuilding.com, and it was on from there. Bodybuilding.com was (and still is) my savior when it comes to health and fitness. The site is extremely motivational and helps me feel confident. I learned tons from Bodybuilding.com and BodySpace. I learned to manage my time, prepare meals in advance, and started paying attention to sugars and fats. My body changed fast and I loved it. Sometimes I trained three hours per day because of all the cardio. I was self-conscious in the gym at first because I couldn't run, had terrible lifting form, and didn't want to embarrass myself. There were days I wanted to give up because I thought I would never learn. I couldn't give up on myself though; I did that too much already. I found motivation in people who were also starting out. BodySpace was full of first-time gym goers and it motivated me to continue training. I read a quote one time that talked about professionals all being amateurs at one point. That stuck with me. I never gave up. Now I know what all the machines are and which exercises to use. It's awesome how much I learned in one year. I have Bodybuilding.com to thank for that. I'm a supplement lover. I wouldn't be the athlete I am today without supplements. There is no way I could survive training without them. We need supplements to keep our bodies performing at an optimum level. I'm so thankful for Bodybuilding.com because it taught me about supplements. I love the diet I'm on now. I feel better and have so much energy. When I started the new diet, I craved some of the bad things I ate before like bread, cheese, and fried foods. The more I ate clean, the less I craved bad food. It was a matter of time before I realized how mentally strong I am. I believed I was stronger than my cravings. I wanted the physique of a figure athlete. I eat every three hours and make sure to drink one and a half gallons of water per day. My training split consists of high-intensity cardio for 30 minutes three days per week and moderate cardio for 45 minutes two days per week. I stay away from cardio on leg day and train abs every other day. My weight training is split up into muscle groups that get hit once per week, except shoulders which get hit twice per week because they are my lagging muscle group. For moderate cardio, I love to get on the stairmaster. My favorite high-intensity cardio exercises are 40, 75 and 100-yard sprints. I also love doing sprints on the stationary bike because it helps tone and tighten my quads and hamstrings. The most challenging aspect of my transformation was a mixture of diet and training. It was hard to eat clean and prepare for a show, but it was time-consuming trying to make sure everything was right. Planning my diet 1-2 weeks in advance took lots of time and research. It was trial by error and sometimes overwhelming. Preparing my meals was hard at first because I wasn't sure what to cook or how to store it. It took awhile to figure out, but it got more natural as time went. I'm a lot more efficient at preparing and planning my diet now. I'm glad I never gave up despite the difficulty at first. Training was difficult because I was sore at first. When I found the right supplements, (protein, glutamine, BCAAs) the soreness was manageable and I began to actually like it because it proved that I worked hard. Training and dieting still challenge me, but it's a healthy challenge and I love it. Since the start of my transformation, I have entered three shows and won overall in two. 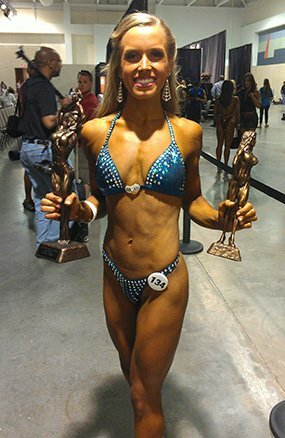 I qualified for nationals at my second show when I won the overall in the open figure division. My first national show will be the Arnold Amateur. I have a huge goal to earn my IFBB pro card in 2013 and I'm on the way to meeting that goal. I entered the 2013 Ironman Magazine and BodySpace Spokesmodel Search and made it to the semifinals. It's amazing that I came this far and placed in the top 20. I want to use my transformation to inspire others to follow their dreams and reach their goals. As I look back to where I started from, I'm in amazement at my accomplishments this year. I'm hopeful that the future is bright. You can do anything you set your mind to. It's all in your mentality. You are the only thing standing in your way from making a healthy change in your life. A clean diet is achievable. Start by adding a few clean, healthy foods to your diet each month. Pretty soon, you'll notice your entire diet change for the better. You will love how you feel and will love the changes you see in the mirror. Training advice to get started can always be found on Bodybuilding.com. Find someone to work out with and hold each another accountable. Trust me, if I can make this happen, so can you. You'll be so glad you took the leap. For people currently working hard to make a healthy transformation, keep going. Your hard work will pay off and you will be able to inspire many by being an example. Bodybuilding.com helped immensely during my journey. I learned about supplements, healthy foods, and great exercises. I love the training articles and recipes included in my supplement orders. It helps to have variety in your diet because eating the same foods can be boring. I love all the knowledgeable people on BodySpace. I'm motivated by others who post workouts and nutrition programs on BodyBlogs. 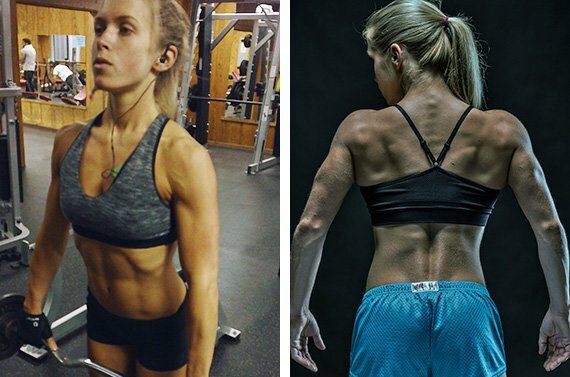 The BodyBlogs share honest thoughts and feelings about dieting, training, and real life issues. It's important to have a community of people who are fitness and goal-oriented around you. Without BodySpace, I would be lost. I buy all of my supplements from Bodybuilding.com and the orders always include free samples. I'm so thankful for those free samples because sometimes I run low on protein and remember that I have those sample packs stored in the pantry. Little things like that make you feel appreciated as a customer, and it makes ordering from Bodybuilding.com fun. I always wonder what the free sample will be next. There are many ways Bodybuilding.com made my fitness journey complete and I'm so thankful for all the information, supplements, and motivation I get from Bodybuilding.com and BodySpace. I want to thank my boyfriend and trainer, Michael DeStefano, for helping and being there for me. I also want to thank my friends at Alluring Artistry—Chris Hollingsworth, Niela Hollingsworth, and Amanda Flint—for their amazing work at getting me "golden brown and delicious" for my shows and for their amazing hair and makeup talents. I wouldn't have felt great onstage without them. I want to thank my friends, Afifya and Courtney, for their unending support and encouragement. I also want to thank my family and Michael Andrews for the awesome pictures that helped me win a modeling contest and land me in the top 20 in the Ironman Magazine BodySpace Spokesmodel Search. I wouldn't have made it this far without any of you.